Duncan Hewitt rounds third base during a game last season. The baseball team opens its season with a three-game series against Rider from Feb. 15-17. Jimmy Lafakis/Collegian file photo. 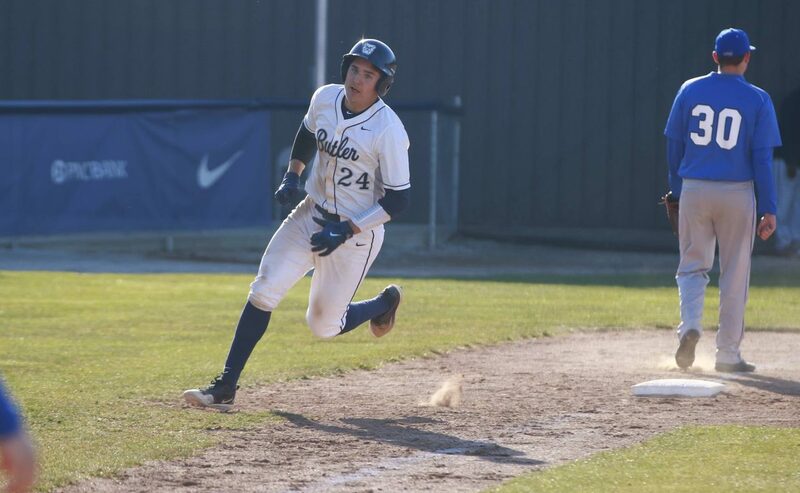 After their most successful season under third-year coach Dave Schrage, the Butler baseball team is rolling into this season behind the program’s best season ever. They tied a program record last year with 34 wins and won their first-ever Big East conference tournament game. The Bulldogs — who went 34-20 and 9-8 in conference — finished third in the Big East, which has had a team win at least one game in the NCAA Regionals every year since the reconfiguration of the conference in 2013. Despite the recent success, the Big East preseason coaches poll did not favor the Bulldogs. Butler finished fifth in the poll, which is bottom half in the eight-team Big East. The polls may have turned out the way they did because of the talent that Butler graduated last year. The Bulldogs’ four leaders in batting average a season ago are now gone. Of the five hitters that started 50 games or more, one player returns: middle infielder Zach Jarosz. Those four senior leaders were Garrett Christman, Michael Hartnagel, Tyler Houston and Gehrig Parker. They combined for a .313 batting average and drove in over half of the team’s runs last year. To say that Butler has lost all of its talent from last year’s team would be a stretch. They return two-thirds of their weekend rotation, which is highlighted by Ryan Pepiot, a preseason all-Big East first team member. As a sophomore last year, Pepiot had a perfect 6-0 record and finished his campaign with a 2.62 ERA while only giving up six runs in conference play. Only four starting batters remain: Jarosz played in every game last year, junior Harrison Freed hit 12 home runs, junior Duncan Hewitt hit .325 in conference play, and Connor Dall looks to step into a larger role as a senior. Even with the offense being more of a question mark than the pitching this year, the pitchers are as confident as ever in the offense. Schrage said he sees the same in the players: confidence in themselves and in each other. Butler will also have to replace pro-level talent from last year’s roster. Connor Mitchell got picked in the 27th round in the 2018 MLB Draft, Christman signed with the Giants and Hartnagel is now playing independent baseball. Pepiot has had multiple scouts at each throwing session, Freed is set to play in Cape Cod this summer and closer Jack Pilcher was an asset for the Bulldogs last year. “It is really high-level college baseball with guys who are potential Major Leaguers out there,” Schrage said. The Bulldogs open up their season against Rider in South Carolina on Feb. 15. The home opener is against Anderson University on March 5. Big East play begins on April 5 as the Bulldogs welcome the defending league champions, St. John’s.